Electrical energy carries some of the characteristics of a commodity. After all, it looks and feels exactly the same wherever it is generated. It can be traded in global markets, and used in any quantity. because of the nature of power generation (depending upon the technology, it takes time to ramp up generation), price also varies as a function of lead time between contract an delivery. There may be be, for instance, a day-ahead exchange, an intra-day exchange (a few hours ahead), and a balancing power market (right now), with widely differing prices between them. Why is price so important in this discussion? It captures the value of electric power to the system, at a given time and a given location. Its variability also captures the performance (or lack thereof) of the system in following (satisfying) demand. 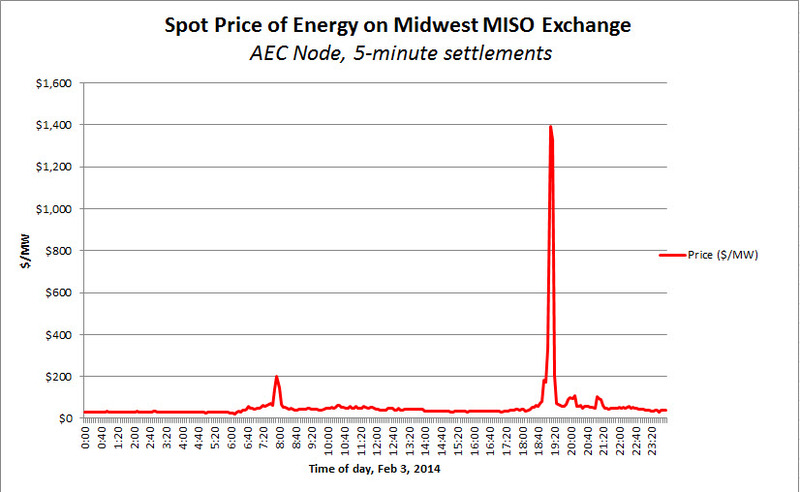 This figure shows the variation of the 5-minute price of a MW of power along the day from about $30 to about $1,400, for a grid node named AEC (there are hundreds of grid nodes), on the MISO Midwest power exchange (which groups 15 states and provinces). Ideally, the price of energy on the power exchanges would remain broadly in line with long term energy prices. Since price represents the feedback variable for the energy system as a whole, its gyrations show a system that is very unstable when looking at time periods of a few minutes to a few days (it looks much more stable when looking at longer time frames). Because instantaneous demand is very inelastic (users won’t change their demand in the next ten seconds because there is less power available), the radical price variations during the day show how significant an impact power storage could have on the performance of the whole system.